So, what am I reviewing, well the great NutriBullet blender, one of which I have had for over 6 months now and it’s the best small kitchen gadget I’ve got. This little beauty was introduced to me by my son-in-law who was making us all a tomato soup. We were chatting in the kitchen whilst he was playing head chef! I was taken by how easy it was to clean the blade and the food container that it screws onto. He just unscrewed the blade and ran it under the tap for a few seconds, then did the same for the container. The model he has is the NutriBullet 600. The 600 stands for the size of the motor which is 600watts. As soon as I got home, I ordered one, even before I’d made a cuppa. It came the next day and the first thing I did was chop up all my ingredients for a soup. Celery, carrots, potatoes, a few lentils and of course an onion. It will soon become apparant when you first use this blender, that it is very powerful. In fact, if you want to have a chunky soup, you’d better only blend for a nano second because this unit is so fast, your ingredients will be chopped double quick time. The next morning, after going to Aldi for some fruit, I made my husband and I, a breakfast smoothie. This is where the NutriBullet comes into its own. Banana, strawberries, blueberries, some organic yoghurt, an apple, a few almonds, some organic oats and a dash of milk. Using the larger vessel and making sure not to fill it over the marker, I whizzed it for a few seconds and voila, a lovely tasting fruity breakfast with all the fibre and goodness included and no waste at all. The nuts were pulverized into oblivion but you could still taste them…yummy! I use this unit every day. Chopping onions is very good, no more weeping and stinging eyes. I don’t hand chop anything anymore, the blender is so easy to use, it makes cooking a pleasure. Don’t you just hate the chopping part! This blender really came into its own when we had visitors with a young child. Usually he had one of those cow and gate junior foods. They are quite convenient but personally I’d rather make my own. So here we are about to have a Sunday roast and the baby food’s been forgotten. Never mind, I said, I’ll blend a little of our dinner. A bit of roast potato, a piece of carrot, some peas and then the chicken. I popped a little gravy in and in 2 seconds dinner was served for junior. My God, you should have seen that child go. He ate his food quicker than our dogs do! Our visitors bought a Nutribullet the next day! Where did they buy it from? John Lewis of course. Most prospective buyers will generally only buy from a company who has at least 4 stars out of 5 from its reviewing customers. The company I advocate is a 5 star company all round! That company is IMHO the UK’s superior departmental store John Lewis. I can’t find any other store selling this item at this price and you get so much more from John Lewis including a complimentary 2 year guarantee! Plus their price promise, ‘never knowingly undersold’. Wedding present, birthday gift, Christmas is coming! This would be the ideal gift as a wedding present. Perhaps a Christmas gift for the chef or even a birthday present for someone who loves to cook, or someone who doesn’t. It saves so much time and makes cooking a pleasure. 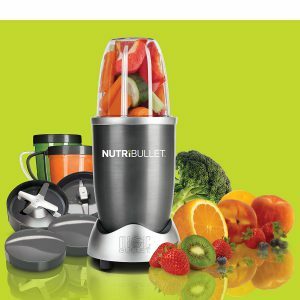 The secret of the NutriBullet is its powerful 600 watt motor, combined with bullet cyclonic action, that forces everything through the turbo extractor blades at an incredible 20,000 RPM, breaking down and pulverising stems, seeds and skins where some of the usually neglected essential nutrition lies. There is the 900 model but IMHO the 600 does all that you need and it’s much cheaper to buy. The sleek and compact NutriBullet is the superfood nutrition extractor loved by millions around the UK. Take charge and feel the tremendous effects that real, nutrition-extracted whole food can have on you and your loved ones health and wellbeing. 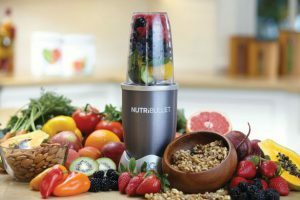 Unlike everyday juicers and less powerful bullet blenders, the NutriBullet completely breaks down ingredients into a pulp free, delicious smoothie. It bursts open seeds, cracks through stems, and shreds tough skins to get the most out of your fruit and vegetables. The super powerful 600w motor and cyclone technology produces a better, smoother smoothie without all the pulp and bits that you get left over by a regular juicer or less powerful bullet blender. 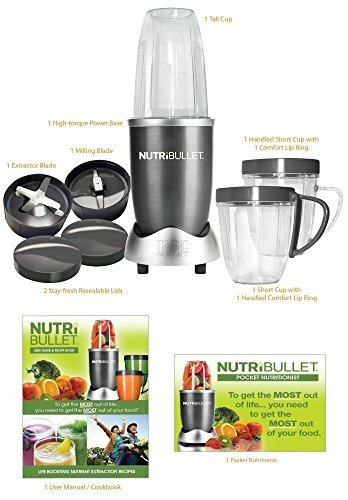 The NutriBullet system is so easy to use, simply load the container, place on to the power base and twist the container to the on position. When blended, twist the container back to off and remove from the base. Don’t overfill the cup, there is a fill line. If you do, it will leak because of the pressure involved. The powerful 600W motor and cyclone technology produces a better, smoother consistency without all the pulp and its extremely easy to clean. Simply rinse under the tap and its ready to use again. Chopping all vegetables for soups with no more onion eyes! All veggie is put through the Nutribullet for stews and cassaroles; simple! Baby and toddler food is easy. They can have exactly what you have, no more buying special food for them. The food is healthier, with no unwanted additives and they just love it! They get used to greens, veggies and other foods kids tend to shy away from. No fussy eaters in this family! Chopping nuts and seeds for toppings on puddings, porridge, yoghurts and sundaes. Breakfast is always tasty with such an array of smoothies to experiment with. Last but not least this gadget can change your life. Within the nutrition handbook that comes with NutriBullet, there is an amazing 6 week plan called “The Superfood 6 Week Transformation Plan”. 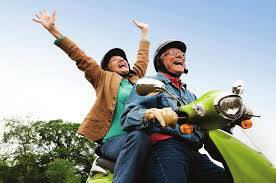 This program will make you feel the best you’ve felt in years. It is not a strict diet, it is very versatile and within a few days of trying it you will not look back. You will feel so good and energised, this will be the way you’ll want to eat for good. It’s not a diet, it’s a change of life to a healthy life! At the rear of the handbook, is a journal for you to fill in so you can check your progress and write down the meals you’ve had. Recipes are included in the handbook for snacks, super soups, healthy wraps and sandwiches, good grain dishes, delicious side salads, and dinners. Of course, there are also plenty of ‘NutriBlast’ recipe ideas ie. 50% leafy greens, 50% fruits and 1/4 cup boosters and the sky’s the limit with your own imaginitive ideas for your own NutriBlasts! As far as I’m concerned, this blender is the bees knees. I will never review a product I haven’t bought and tried myself and this is one of my best buys ever. I hate cooking, but this little beauty makes it less of a chore for me and speeds up the process no end! Enjoy! Thanks for the interesting review of the Nutri Bullet Blender. From your review it seems like it’s one of the best blenders on the market. But I have some questions about it. How noisy it is? From my experience some powerful blenders can be very noisy. I understand that it’s only the blender, right? I can’t use it for juicing? I have seen some blenders that are also juicers. We currently have a Nutribullet RX and it definitely gets a lot of use in our house! My husband makes his daily shakes with it (as do I, depending on my mood!) and I just love how powerful yet compact it is. I love blending my own cashew milk from fresh cashews, honey, and cinnamon with it. A nice treat to end the day with, without going overboard on the calories. I never thought of chopping onions with it, what an excellent idea! And I am going to have to play around with creating soups. 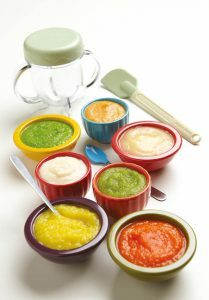 I have used it to puree soups before, but only after it had simmered on the stovetop first. Wow! I’ve seen quite a few websites, but yours is the best yet! 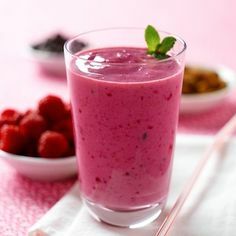 You have great pictures and topics to interest everyone who likes smoothies. I love smoothies. But Blenders don’t last very long. I’ve been searching for a Blender that is easy to clean and a long lasting blender. You review convinced me to try out the nutribullet. How long have you been using nutribullet? I’m just curious to know that it will last long.